It’s been months since we heard anything of Muntz. Here’s a picture I just received. Apparently he’s working as a nose rest for Champ. It’s a tough job that looks much easier than it is, sort of like artist’s model where you have to stand still for hours and hope you don’t get cold. I agree, a cat’s job is never easy. They make it look it easy sometimes, but that’s their mastery and elegant spirit. SIR – I cannot agree that rats will not live near goats, possibly because of the smell (Letters, February 18). My wife kept goats in a Nissen hut in our garden and the recurrence of rats was resolved by an elderly but active Jack Russell. Perhaps the effect of the smell of the goats was obviated by my wife’s habit of bringing them into the house for baths (in the family bathroom) at regular intervals. 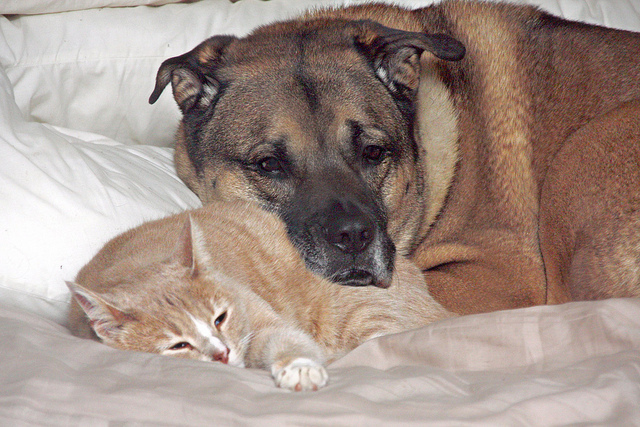 Are dogs generally immune to allergic reaction to cats’ fur? Oh, how interesting. Thanks, Canehan! We bathe the goats occasionally in the bath. But we use the shower spray attachment, we don’t give them a candle-lit bubble-bath or anything like that. They seem to enjoy it, but they take absolutely ages to dry even using a hairdryer (that’s us using the hairdryer). I think we’ve done Vesla most often. Because of the drying time, sometimes we’ve just done the back half when it’s embarrassing taking her for a walk because she isn’t looking her best. It’s a shame she won’t go in the dryer. Goats don’t usually eat food from the ground, unlike horses and cows, supposedly because they’re very particular about droppings having been dropped. That’s not something that bothers horses, I noticed it today at the stable. I’ve never seen any rats around here, but there are loads of mice. They find the hay attractive, probably. I may have mentioned before that our goats smell lovely, like lanolin. I’ve been told that it’s the male goats that don’t smell too good, but I’d like to smell for myself before I start slandering them. Julia, I love that little Uruguayan goat. When I was young, my family used to spend summer vacations in the Alps. Whole herds of sheep, several hundred at a time, used to walk up from hundreds of miles away in the South to spend the summer in the Alpine pastures, and we would often encounter them while hiking up there. As well as a few dogs, each herd usually included several goats. I thought that this was because the goats were much smarter than the sheep and would think individually and provide leadership, not like sheep which would blindly follow the other sheep even if they went over a cliff. Once we encountered goats (males ?) which had really beautiful horns, curling horizontally from their heads, perpendicular to their spines. They must have been an exotic breed. Nowadays this trek on foot is no longer practical because of increased road traffic – plus the time it would take, with sheep eating and resting on the way – and the sheep are trucked to the mountain villages instead. But once up there, they and the goats still have a great time. (They have shepherds too, themselves a special breed of people). m-l, they take all the sheep and cattle up to mountain pasture here in Norway too. I haven’t heard of it ever being such a long trek here, though. Perhaps Trond has. They may not have been males with those horns. Female goats have pretty big horns too, especially the exotic breeds as you say. I like the horns on the Markhor, the Pakistani national animal that lives in the Himalayas. I have read somewhere about shepherds keeping a goat with a herd of sheep. It’s something to do with keeping predators away, but I’m ashamed to say I’ve forgotten the details. Lucky you, spending your summers in the Alps! It’s quite possible that the goats would also be a defense against predators. Sheep have been bred over millennia to be stupid and defenceless, but goats have been more resistant to this genetic manipulation. Ahh, so perhaps mingling sheep and a few goats is very common…. I’m such a city “girl” that I’ve no idea. I should go to the Alps more often. Lucky you, m-l! Heidi lived in Switzerland. The part of the Alps I know is farther South (about midway between Lake Geneva and the Mediterranean. The closest big city is Turin (Torino) in Italy. Along the years I also realized that sleeping on a bed made of hay mustn’t be very comfortable… growing all is but loosing illusions ! dearieme, No, not la Savoie, le Dauphiné. Savoy was not French territory until (I think) 1863. Savoy and the area around Nice were small Italian states until unification. The French government of Napoleon III helped the Italian revolutionaries, and as a reward France was given the territories of Nice and Savoy, which were on the French side of the Alps (the current border follows mountain peaks, and the local Savoyard speech is closer to French than to Italian). Savoy looks very different from Dauphiné in that it still has forests up to the tree limit. This is because Savoy did not have a navy. In Dauphiné the mountain forests were largely decimated under Louis XIV in order to provide timber for the navy, so the mid-high landscapes which used to be forested are mostly crumbly rock, with just enough plants to provide some summer food for sheep (which are not very good for the landscape either). Some forests are creeping back up, because local subsistence agriculture is no longer economically worth doing, and the trees are reclaiming abandoned fields.